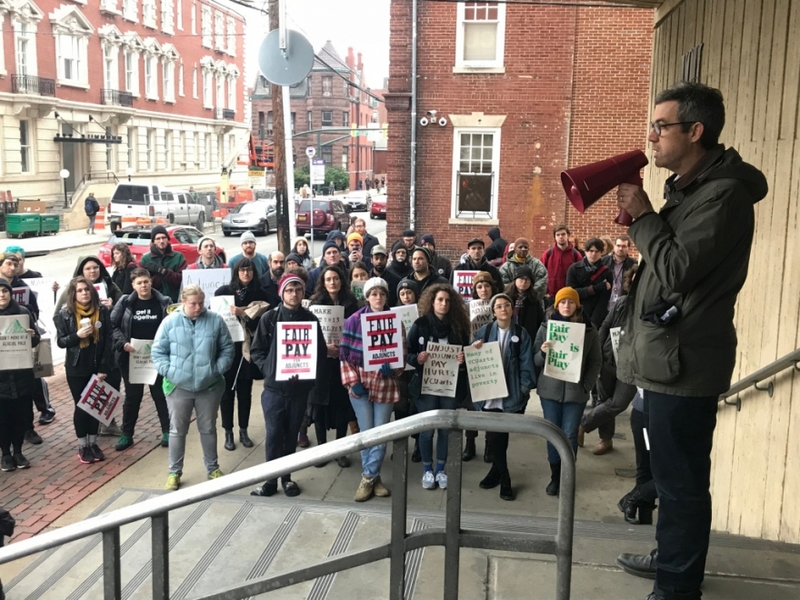 VCU Arts Professor Corin Hewitt addresses crowd gathered Friday morning at VCU rallying for fair pay for adjunct professors. About 100 VCU adjunct arts professors gathered for a rally on campus this morning (12/8) – demanding more pay. Right now, adjunct arts professors earn about $2,500 for a typical semester-long class at VCU. The school’s dean has promised about $3,000 per class for the upcoming spring semester, but many say that’s still not enough. In a petition, advocates are calling for double that. Corin Hewitt is a tenured sculpture professor at VCU. In 2007 he was making $4,500 per class as an adjunct professor at the Tyler School of Art in Philadelphia. He says it’s an important time for schools like VCU to think critically about fair pay. “And I think we could lead the country actually in equity and equitable pay for our adjuncts, I think it’s a great opportunity for us. I really hope it doesn’t become an “us vs. them” and it’s something the administration chooses to put its full weight behind,” said Hewitt. According to the American Association of University Professors, more than 50 percent of all faculty positions across the country are part-time.